Only E. M. Adams gives you the path from least to most restrictive restraints. 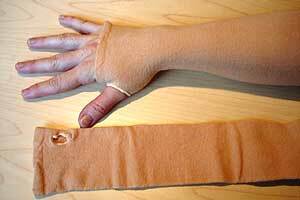 Arm Skin Protectors protect fragile skin, IV, and wound sites from tears and abrasions by covering the arm with a cotton and spandex-blend sleeve, covers the hand, elbow, and forearm and allows full freedom of the fingers and thumb. One size fits all. Available in tan and brown. 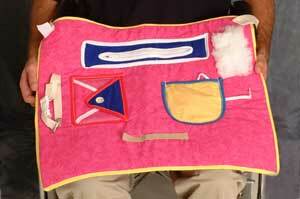 Activity Apron aids in stimulation of motor skills and occupies a patient's time. Bright colors provide visual stimulation and the materials provide different textures. Includes a zipper, pocket, picture holder, velcro strip, fur strip, and a quick release buckle. 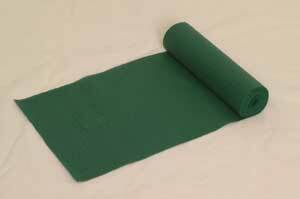 Sure-grip Non-slip Material helps prevent sliding, spills when eating. It creates a stable work or craft area, aids in seating and positioning. 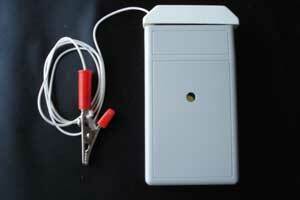 It can be used in wheelchair or Geri-chair. 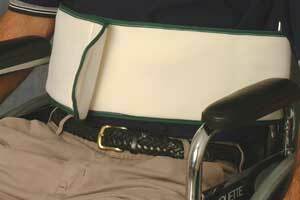 Our Self-release Belt provides the extra padding required for comfort and security. 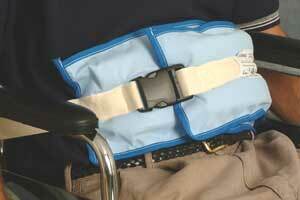 Designed to be used in either wheelchair or Geri-chair to keep the patient from sliding forward. JCAHO inspired "Least Restrictive."